Published on December 28, 2005 by Wade Shepard Follow me on Twitter here. 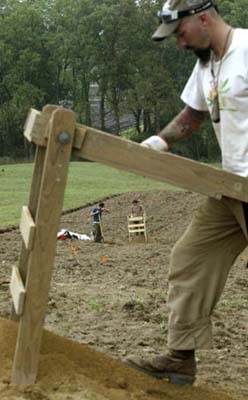 This photo is of me screening some dirt, looking for long gone evidence of long gone people. 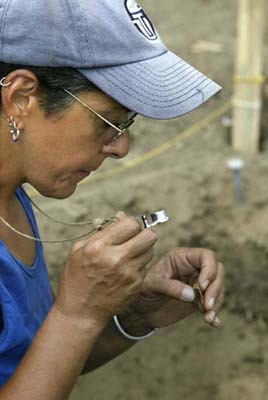 This is JoAnne, a long time India traveller and now Afracanis Archaeologist. She rocked me throughly…..she matched me joke for joke, raunchy story for raunchy story, traveller tale for traveller tale and made me an admirrer. It is real beautiful when one comes upon a person whose very presence strums one’s inner chords into feeling purely marvelous. Her influence had a drastic effect upon me…..the results of which remain to be crystallized. Back to Asia! 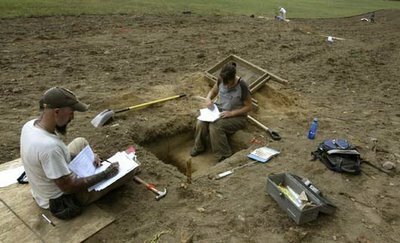 These are Photos from an Archaeological excavation in Orange County, NY that I was on earlier in the season. The photos were from a newspaper article in the Times Herald-Record, who did a story on us.